V.S. Ramachandran is Director of the Center for Brain and Cognition and Distinguished Professor with the Psychology Department and Neurosciences Program at the University of California, San Diego, and Adjunct Professor of Biology at the Salk Institute. Ramachandran initially trained as a doctor (MBBS) at Stanley Medical College, Madras, India, and subsequently obtained a Ph.D. from Trinity College at the University of Cambridge. After that, he recieved an honorary FRCP; London (Fellow of the Royal College of Physicians) and two honorary doctorates (DSc; honorus causa). Ramachandran’s early work was on visual perception but he is best known for his experiments in behavioral neurology which, despite their apparent simplicity, have had a profound impact on the way we think about the brain. He has been called “The Marco Polo of neuroscience” by Richard Dawkins and “The modern Paul Broca” by Eric Kandel. In 2005 he was awarded the Henry Dale Medal and elected to an honorary life membership by the Royal Instituion of Great Britain, where he also gave a Friday evening discourse (joining the ranks of Michael Faraday, Thomas Huxley, Humphry Davy, and dozens of Nobel Laureates). His other honours and awards include fellowships from All Souls College, Oxford, and from Stanford University (Hilgard Visiting Professor); the Presidential Lecture Award from the American Academy of Neurology, two honorary doctorates, the annual Ramon Y Cajal award from the International Neuropsychiatry Society, and the Ariens-Kappers medal from the Royal Netherlands Academy of Sciences. In 2003 he gave the annual BBC Reith lectures and was the first physician/psychologist to give the lectures since they were begun by Bertrand Russel in 1949. In 1995 he gave the Decade of the Brain lecture at the 25th annual (Silver Jubilee) meeting of the Society for Neuroscience. In 2010 he delivered the annual Jawaharlal Nehru memorial lecture in New Delhi, India. Most recently the President of India conferred on him the second highest civilian award and honorific title in India, the Padma Bhushan. And TIME magazine named him on their list of the 100 most influential people in the world. Ramachandran has published over 180 papers in scientific journals (including five invited review articles in the Scientific American). He is author of the acclaimed book “Phantoms in the Brain” that has been translated into nine languages and formed the basis for a two part series on Channel Four TV (UK) and a 1 hour PBS special in USA. NEWSWEEK magazine has named him a member of “The Century Club” – one of the “hundred most prominent people to watch in the next century.” He has been profiled in the New Yorker Magazine and appeared on the Charlie Rose Show. His new book, "The Tell Tale Brain" was on the New York Times best-seller list. 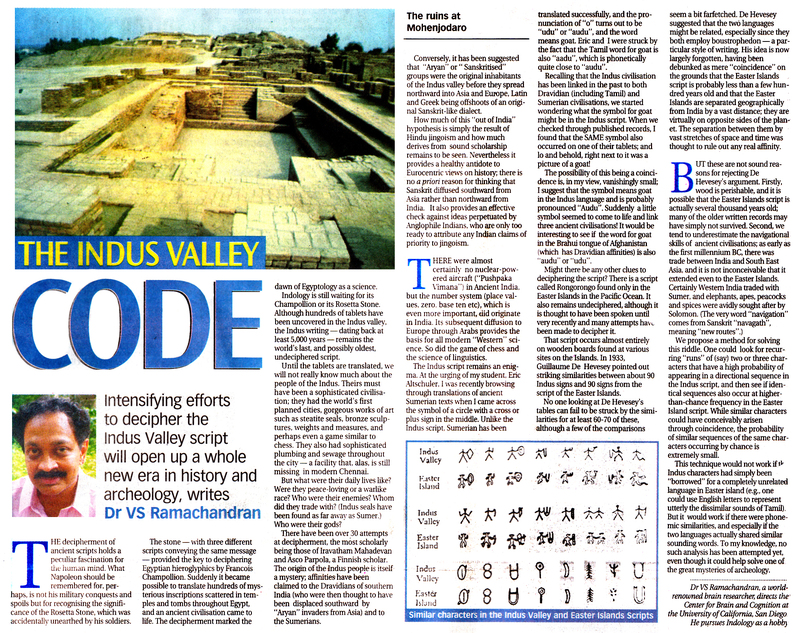 In addition, Ramachandran has an interest in history and archeaology (see his article on the Indus Valley Code).